We are almost done with our latest mask project. It was a bit more difficult than I thought but that is true with almost any project. Just before Halloween Sarah Jacobsen and a small contingent from the Emerald Ballet in Bellevue came up to the studio to talk about some masks for their NutCracker production. After a short description I realized they would be more of a headpiece than a mask. After forming a plan we were off. Once started the ideas flowed quickly and Sam sketched out the concepts. We refined a little, made a materials list, checked in with the Ballet and I started to make patterns. The Mouse Queen presented a new challenge. Eyes. With most masks your own eyes suffice but for this mask the eyes would be on the top and Large. I am sure something exists but rather than look about for hours I was going to try to make these myself. It took a trip to the local hardware store, the purchase of many different materials, and in the end it was the last one I tried. (of course) Fried brain cells not withstanding the result was better than I thought. New ideas for creatures came so fast and furious I had to refocus to stay on target. The rest of the Mouse Queen went quickly and Sam made a spectacular crown to finish it off. The Nut Cracker posed more than few more challenges. I was trying to make a mask that would fit an older male dancer and a just teen female. I used my head as one extreme and Izzy’s as the other. Saturday’s visit to Ballet would confirm whether I did this right or not. 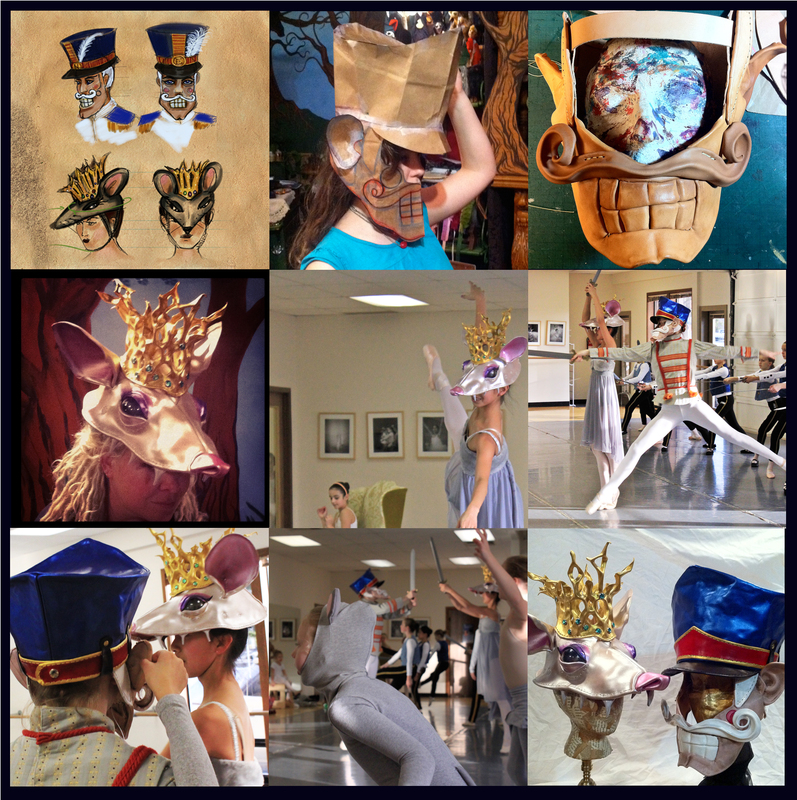 So Saturday arrived and we took the masks to Bellevue to try them on the Dancers. This is an exciting but nerve-wracking part of the process. The Mouse Queen was a hit, The Nut Cracker was too big and was the cause of much merriment as it slipped down over the Dancers tiny bird head. Apparently, Izzy’s head is still much bigger than a 14-year-old ballerina’s. I failed Miserably.The mask looked HUGE and needed to be resized. I quickly added another elastic strap so that wouldn’t happen again but more work was needed. That hat looked great and the point at the top accentuated the Dancer’s spins.It seemed that everyone loved what we brought so that is always a good feeling. The best reaction of all came from a tiny girl who said in an adorable pip squeak voice, “I love the mouse queen’s crown. It looks like it is made out of Cheeeeeeeze!” Another moment of mirth came as I looked back at the photos I had taken during the day. In one a tiny little arm can be seen reaching up to feel the ear of the Nutcracker. A little moment of curiosity caught on film that reminds us how precious our children are. The mask has been resized and is in need of some paint. Everything else is coming together and we will be ready to hand them off this weekend. Just in time to see them twirl around on Stage. Now it is time to go eat some pie. It is Thanksgiving after all. ← Is Halloween Here Already??? ?